Día de los Muertos, or Day of the Dead, traditionally occurs on November 1 and 2–just days before the general election on Tuesday, November 8. The traditional Mexican celebration is about making contact with the spirits of the dead, to let them know that they are not forgotten and that we still care about them here on Earth. So we thought, what better way to tell the story of plastic bag pollution than to connect with sea creatures that have died because of plastic pollution in our oceans? In our new mini-film “Los Fantasmas Del Mar,” a medium has the uncanny ability to speak with marine mammals that have passed on from this world. Tapping into the great abyss, she communicates with the spirit of a gray whale that happens to know a surprising amount about California politics–and Proposition 67 in particular. Who knew? Our creative partners–many of whom worked on our viral hit “The Majestic Plastic Bag,” filmed Sra. Sargassos in her native language, but they’ve added English subtitles to reach more voters. Muchissimas gracias to our pro-bono team: Lupe Gudino, Jose Flick, Arnie Presiado, Gary Le Vine, Kevin McCarthy, Regie Miller, Paul Flick and, finally, Alicia Wu as the mysterious Sra. Sargossas. Día de los muertos, o Day of the Dead, tradicionalmente ocurre en Noviembre 1 y 2, días antes de la elección general del Martes, Noviembre 8. La tradicional celebración mexicana se trata de conectarse con los espíritus de los muertos, para dejarles saber que no han sido olvidados y que todavía se les quiere en esta tierra.¿Así que pensamos, qué mejor manera de contar la historia de la contaminación de la bolsa de plástico que conectarnos con las criaturas marinas que han muerto debido a la contaminación de la bolsa de plástico en nuestros océanos? En nuestra ultimo mini-corto “Los Fantasmas Del Mar”, Una medium tiene la gran habilidad de hablar con los mamíferos que se han marchado de este mundo. tocando el gran abismo, Ella se comunica con una ballena gris quien sorprendentemente sabe mucho sobre política en California y en particular sobre la proposición 67, Quien podría saberlo? Feliz Día de Los Muertos y recuerden en votar SI en Prop 67 y NO en Prop 65! Muchissimas gracias a nuestro equipo de pro bono: Lupe Gudino, Jose Flick, Arnie Presiado, Gary Le Vine, Kevin McCarthy, Regie Miller, Paul Flick y, por último, Alicia Wu como la misteriosa Sra. Sargossos. 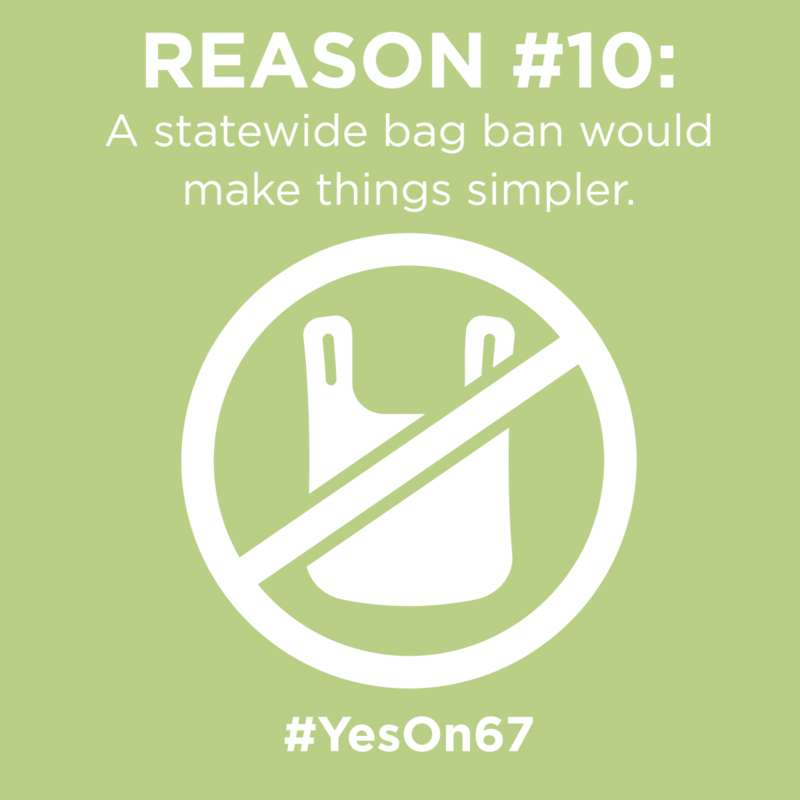 Oct. 6, 2016 — Manufacturers are trying to overturn the state’s effective bag ban at the ballot box this November. 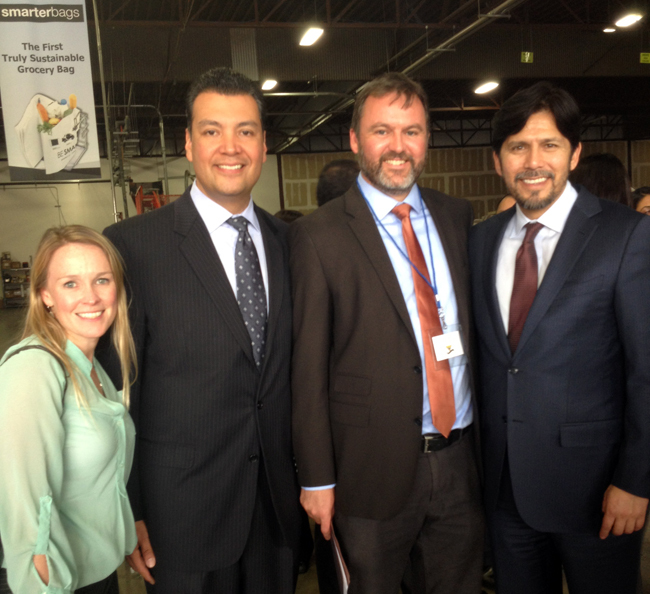 Did you know that all that hard work we did together to get California’s plastic bag ban passed in the state legislature years ago is now under threat? Out-of-state and out-of-touch Big Plastic is pushing bags on us once again by funding an initiative to overturn the statewide ban. So please come out Nov. 8 during the presidential election to vote YES to uphold the sensible ban. Bag bans work! Why go back? We know you get it, but here’s info to share with your network. 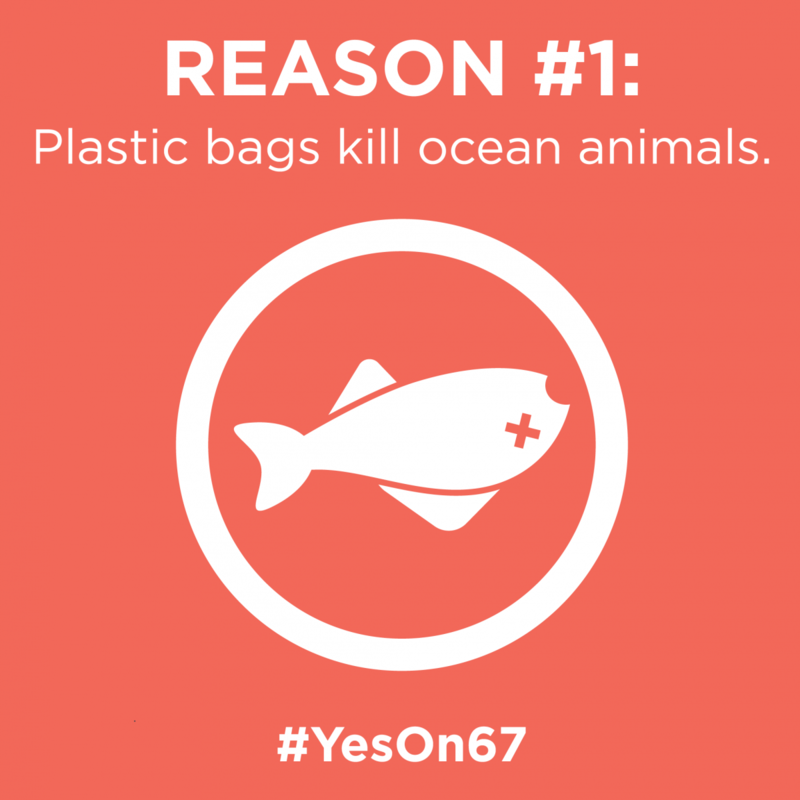 Plastic bag pollution poses a deadly threat to 663 species of marine and land animals. Each year, thousands of animals become entangled in plastic bags and drown, or ingest them and starve. 2. They poison the food chain. In the ocean, plastic bags break down into tiny pieces, which absorb large amounts of pollutants. These toxic pellets are then eaten by small fish and animals that are in turn eaten by larger fish… ultimately passing those toxins on to us. Do you want to eat plastic-filled fish? 3. They’re used for just a few minutes, but last a few lifetimes. 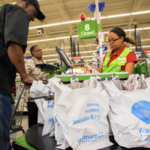 A shopper will typically use a single-use plastic bag for fewer than 12 minutes. However, that bag will remain in our environment for up to 1,000 years and will never fully biodegrade. 4. 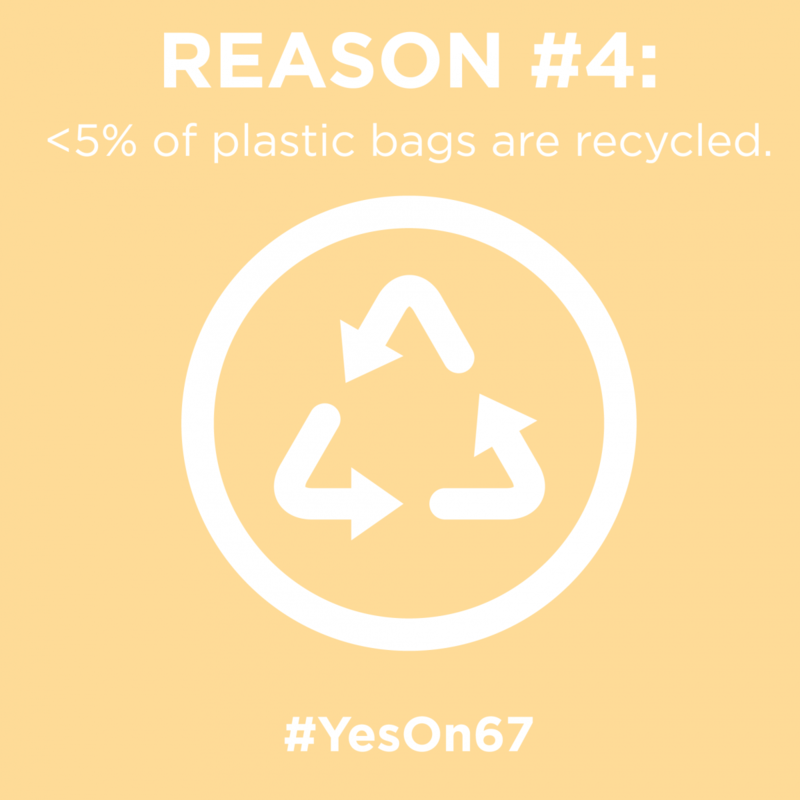 Less than 5% of plastic bags are recycled in California. The plastic bag industry may say recycling is the answer, but that’s simply not the case. The tiny fraction of bags that do make it to recycling plants yield very little usable material. 5. Plastic in the ocean will outweigh fish by 2050. If we don’t take immediate action to reduce our appetite for plastic products, you’ll soon be more likely to reel in a food wrapper than a rockfish. 6. They cost taxpayers millions every year to clean up. NRDC estimates that California spends up to $100 million each year dealing with plastic bag litter. We can think of a few million better ways to spend taxpayer dollars. 7. They make shopping more expensive. Think you’ve been getting all those plastic grocery bags on the house? Think again. The real cost of those “freebies” is built into the price of consumer goods. 8. They’re an eyesore in our neighborhoods. Chances are you’ve seen a few of these “urban tumbleweeds” blighting your block. Banned bags mean cleaner communities. 9. The plastic bag industry profits off pollution. Plastic bags are big business in California, racking up nearly $200 million in 2012 alone. But who’s raking it in? 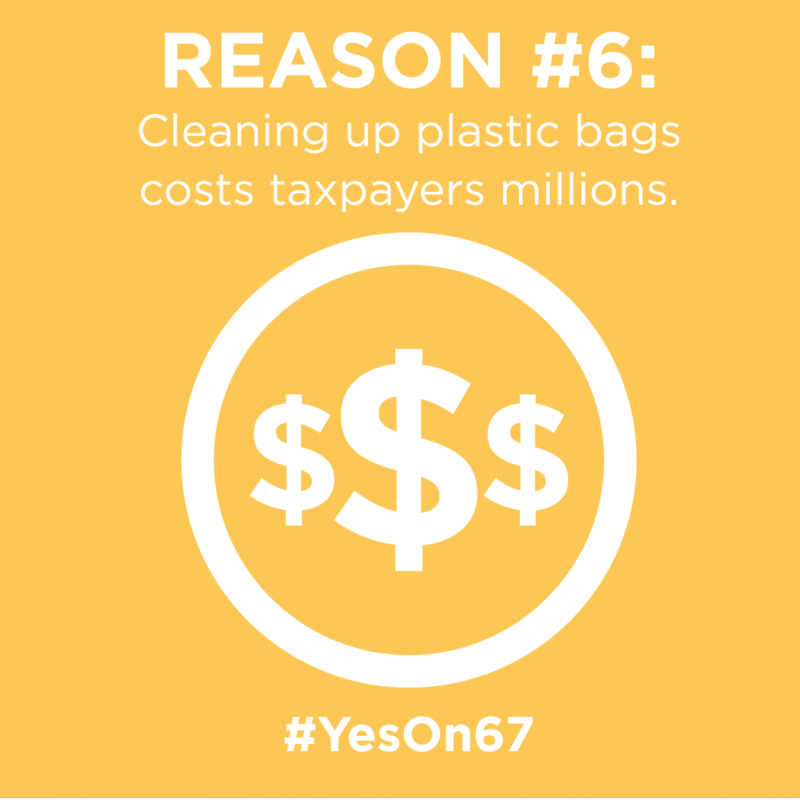 Not the Golden State: 98% of contributions to keep plastic bags were from companies outside of California. 10. A statewide ban would streamline existing bag laws. 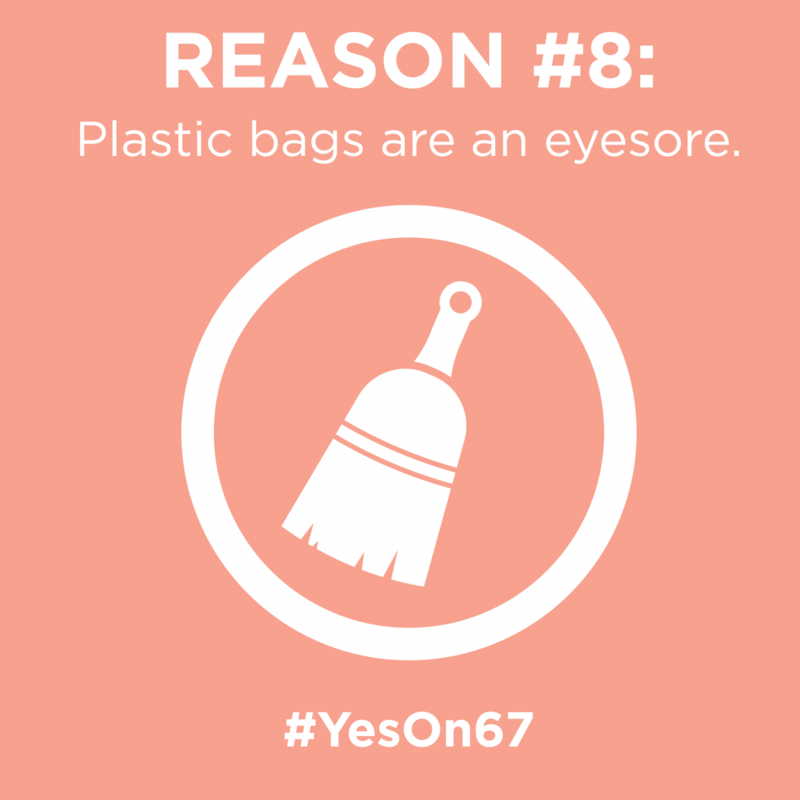 Over 1/3 of Californians enjoy living in 148 communities where bags are already banned. A statewide solution would simplify this regulatory jumble for retailers and shoppers alike. 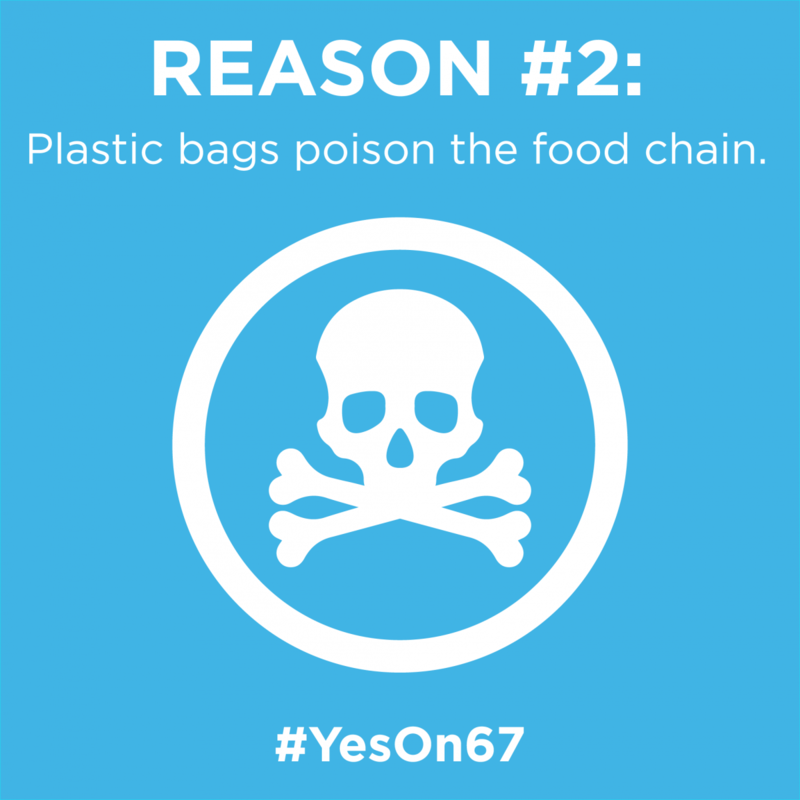 Learn more about Prop 67. Heal the Bay CEO Ruskin Hartley shares his thoughts on a very good day for the prospect of a statewide ban on plastic bags. Experts say that the best way to break an unhealthy habit is to replace it with a healthy one. 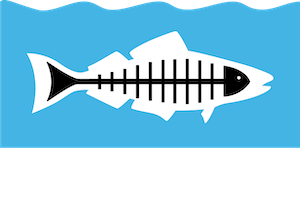 And Heal the Bay is here to help you replace your plastic shopping bags with reusables as you shop this holiday season. To prepare, we’re busily organizing the distribution of thousands of reusable bags across Los Angeles on November 18. Now, to help Angelenos adjust to the upcoming plastic bag ban (effective Jan. 1, 2014), we’ve rebranded this annual citywide event as “Day With a Bag” to get shoppers accustomed to bringing their own reusable bags to the market. We worked hard to help pass the citywide ban. Yet, despite feeling elated with the victory, we remain focused and hopeful that our efforts will fuel a statewide ban on single-use plastic bags soon. In the meantime, enjoy the fact that by going reusable, you’re also gifting the planet this holiday season. We’re giving away nearly 10,000 reusable shopping bags, so find a giveaway location near you! Bag Ban FAQ: What About All That Dog Poop? We did it! After seven years of hard work and diligence, California is poised to become the first state in the nation to ban single-use plastic grocery bags. The overwhelming response has been one of excitement, but we realize there are some residents who have concerns. Nancy Shrodes, our volunteer coordinator, answers a few typical questions. How do I pick up my dog’s poop? Yes, plastic bags are handy for picking up animal waste, but there are alternative and easy ways to continue to be a responsible pet owner! For example, you can bring last week’s newspaper on your walk and use it to pick up poop. 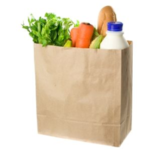 You can also re-use the grocery store produce bags or other forms of food packaging like bagel or bread bags. I line my trash cans with plastic bags from the grocery store. Now what am I going to use? Line the bottom of your bin with newspaper or other paper, and rinse it out periodically after use. You can also buy heavier-weight plastic bags and REUSE them after dumping waste into your outside bin. What about using biodegradable bags? A “biodegradable” plastic bag is a bit of a misnomer. These bags can only break down under very specific conditions and do NOT break down naturally in our waterways, posing a threat to animal life. Bags on our streets inevitably end up in our rivers and ocean, facilitated by the city’s storm drain system. To fully degrade, these bags require heat and specific bacteria present in industrial composting facilities. Will I get sick from using a reusable bag? No! I have been using reusable bags for years and have never gotten sick from them. You can easily avoid any chance of getting sick with easy-care tips. Just use common sense and everyday hygiene. Throw your cloth/fabric tote bags into the wash with your laundry load to clean them. Any of the thick plastic reusable bags should be wiped clean and allowed to dry before you store them. Voilà! You are germ free and the environment is healthier too! Aren’t there bigger things to worry about than plastic bags? Yes, the world is filled with many pressing problems. But Heal the Bay has spent a lot of attention to this issue because plastic bags ARE a big problem — blighting neighborhoods, clogging storm drains and harming animals. They are also a powerful symbol of our throwaway culture. This is a gateway issue for us. The healthy debate about bags gets people to think about other wasteful practices in their daily lives, be it using single-use water bottles or taking a drinking straw at the corner restaurant. Little things add up to bigger things. 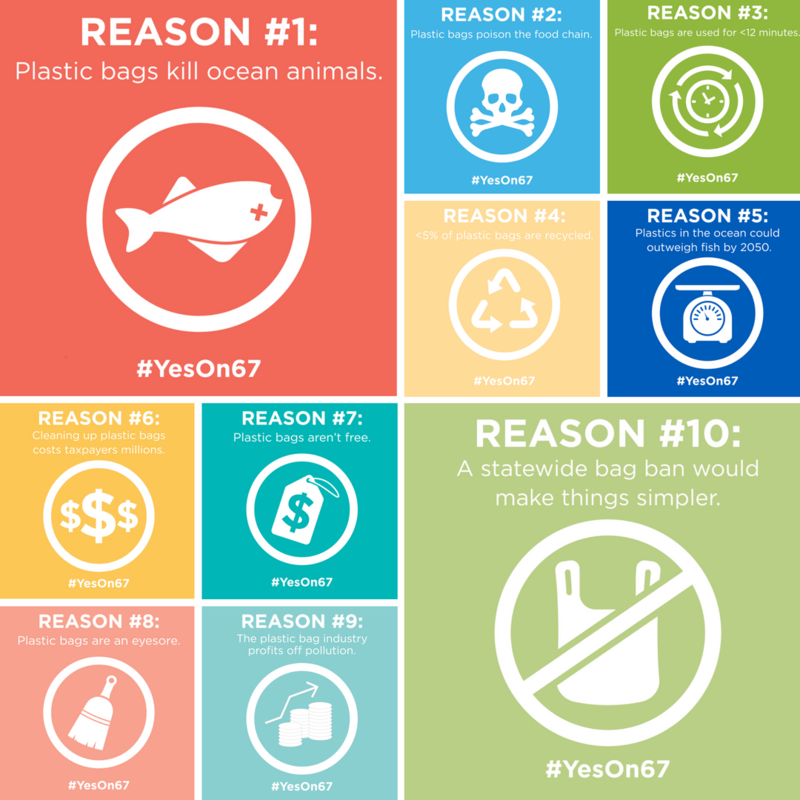 Before joining Heal the Bay, Nancy worked on the bag ban campaign for Environment California. To help educate California state legislators about the ecological and economic importance of the sea to all Californians, Heal the Bay staff joined our fellow environmental advocates in the 6th annual Ocean Day at the state Capitol on April 16, 2013. 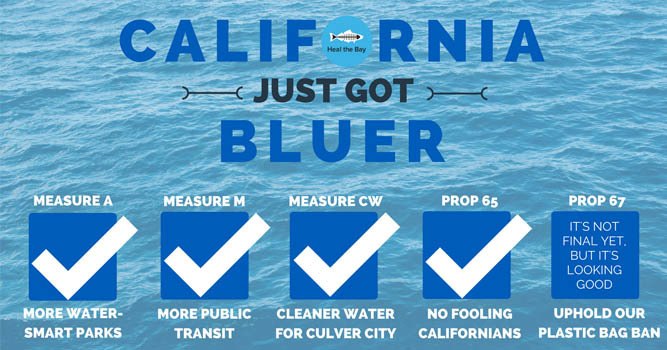 The event lets us work with policymakers to find effective legislative solutions that protect and restore California’s iconic ocean and coastline. Ocean Day participants, representing over a dozen non-governmental organizations, were able to stop by the offices of all 120 California senators and assemblymembers to discuss preventing stormwater runoff and plastic pollution, the success of California’s Marine Life Protection Act, and the impacts of climate change to California’s inland and coastal communities. The timing of Ocean Day couldn’t have been better. Two important bills that would help prevent plastic pollution from trashing our communities and beaches were heard in the Senate’s Environmental Quality Committee the day after the event: SB 405 and SB 529. SB 405, introduced by Sen. Padilla (D-Pacoima), would phase out single-use plastic bags in California grocery stores, convenience stores, liquor stores, and pharmacies and place a charge on single-use paper bags with the hope of encouraging people to bring reusable bags. The bill cleared the Senate Environmental Quality Committee with the votes of Sens. Hill (D-San Mateo), Hancock (D-Berkeley), Leno (D-San Francisco), Corbett (D-Hayward) and Jackson (D-Santa Barbara). 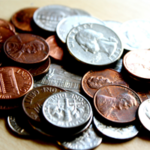 It will next be heard in the Senate Appropriations Committee. Heal the Bay has long supported passage of a statewide single-use bag bill as a means to comprehensively address the negative environmental and economic impacts caused by single-use plastic bags, and Ocean Day presented another opportunity to educate legislators on plastic pollution before this critical Committee vote. As Sen. Padilla noted in a news release about the committee hearing, “Single-use plastic bags are not just a coastal issue. In our mountains, the winds blow discarded bags up into the trees, you can also find them in our rivers and streams, in our parks, and throughout our communities. 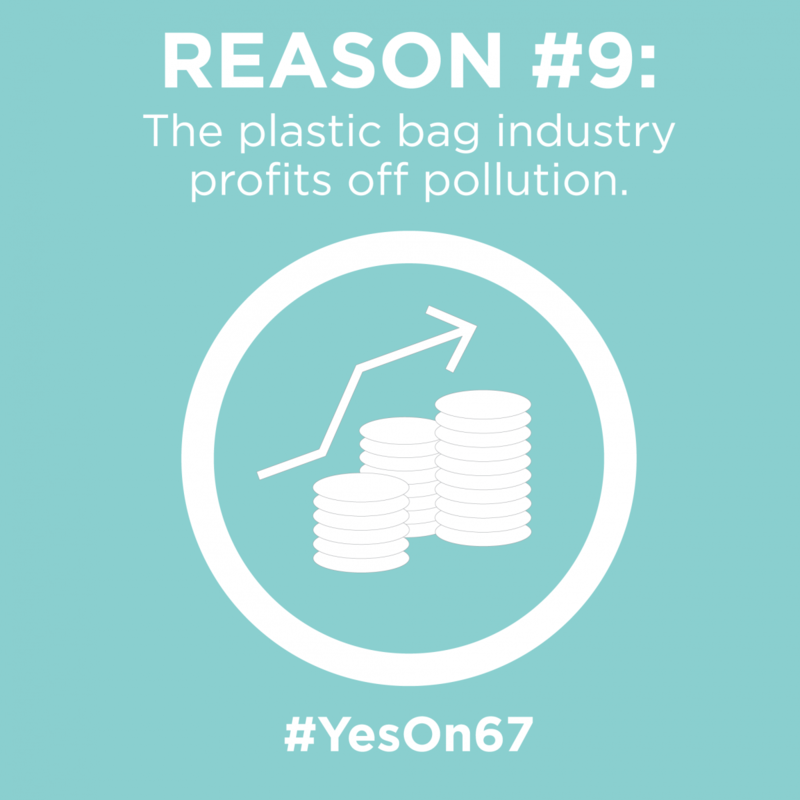 It is a statewide problem that deserves a statewide solution — a solution that focuses on reducing the use of plastic bags.” We will continue to work with Sen. Padilla’s office to ensure passage of this important (and long-overdue) piece of legislation. 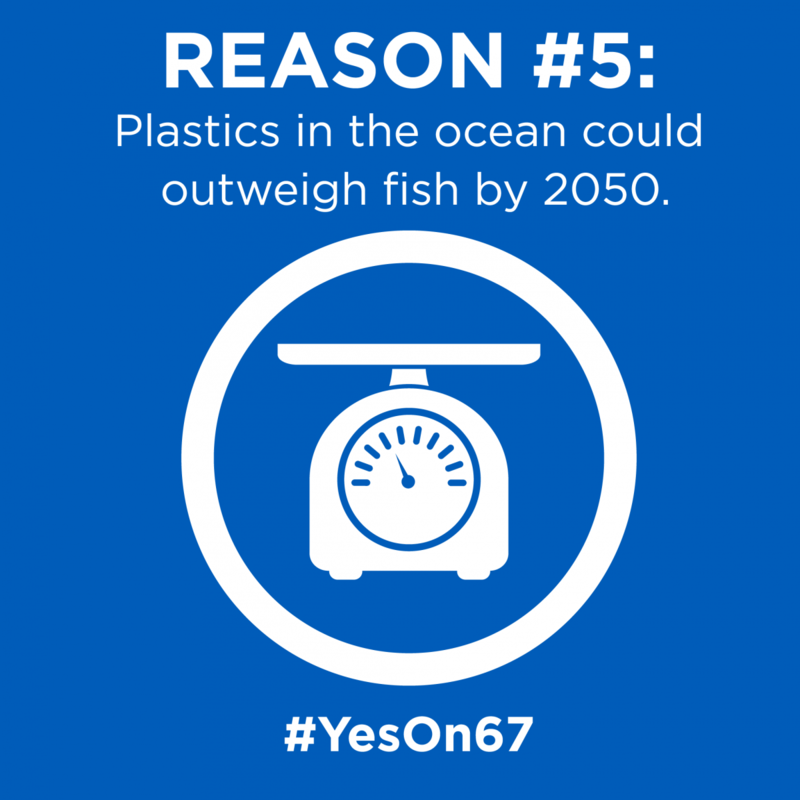 Another bill supported by Heal the Bay – SB 529, introduced by Sen. Leno (D-San Francisco) – would move fast-food chain restaurants away from foamed polystyrene and other nonrecyclable/noncompostable plastics, again with the hope of encouraging more sustainable packaging options. The bill also passed the Senate Environmental Quality Committee with the votes of Sens. Hill, Hancock, Corbett, Leno and Jackson. It will next be heard in the Senate Appropriations Committee. Novelist Ralph Ellison said that education is all a matter of building bridges. Ocean Day was an opportunity for Heal the Bay and others to reach out to legislators and educate them on the problem of plastic pollution and possible legislative solutions. 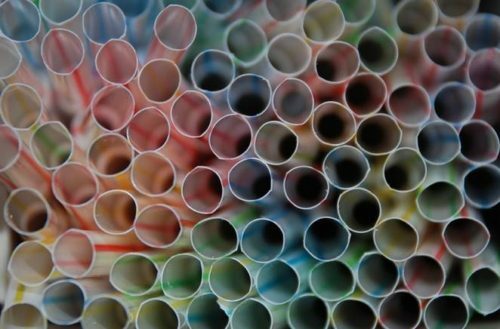 This information was clearly heard by legislators, and today’s Environmental Quality Committee hearing was an important step in ending California’s addition to single-use plastics. Stay tuned for updates on these bills throughout the legislative session! Live in the city of Los Angeles? Urge your councilmember to finalize the single-use bag ordinance that will keep plastic bags from trashing our communities and beaches! 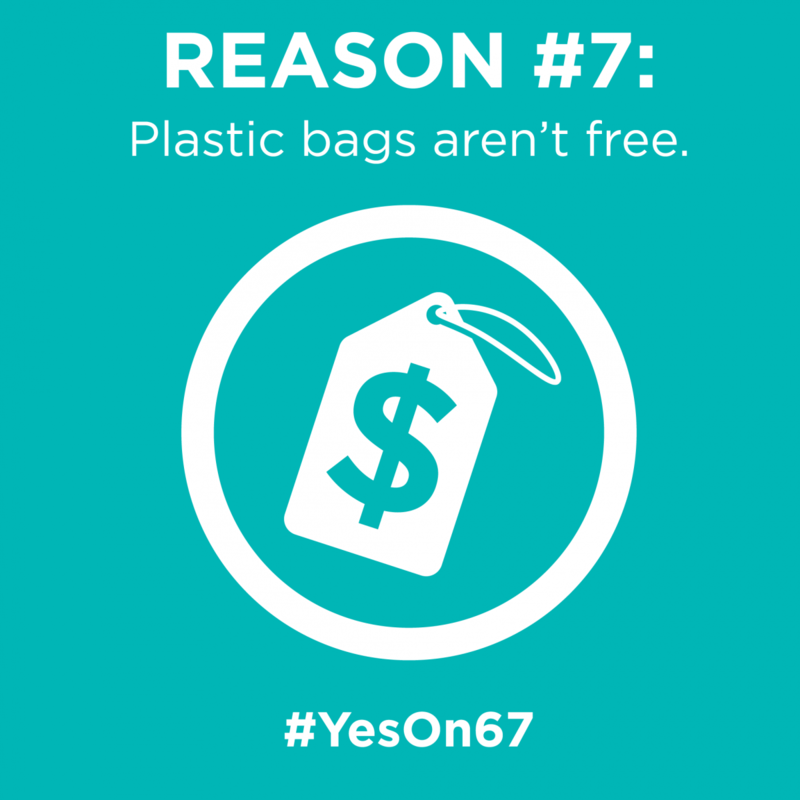 We know that billions of single-use plastic bags are used in Los Angeles every year, and that the majority of single-use plastic bags – even if reused once or twice by consumers – end up in our landfills or as part of the litter stream, polluting our inland and coastal communities and wasting taxpayer dollars on cleanup costs. Los Angeles, we are at a tipping point when it comes to tackling the scourge of plastic bag pollution. On May 23, 2012, the Los Angeles City Council voted to move forward with drafting an ordinance that would ban single-use plastic bags and place a charge on paper bags at grocery stores and select other retailers throughout the City. 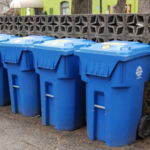 The Bureau of Sanitation recently released its draft Environmental Impact Report (PDF) for public review and comment; comments are due on March 11, 2013. It is our hope that the City Council will vote on the ordinance later this spring. If adopted, Los Angeles will be the largest city in the United States to approve a single-use bag ordinance, and its passage will send a clear message to the rest of the state (and country) that addressing plastic bag waste (and by implication, our disposable consumer culture) is an idea whose time has come. In fact, once passed, Los Angeles will join the company of 65 California counties and cities that have banned plastic bags, including many jurisdictions in SoCal. 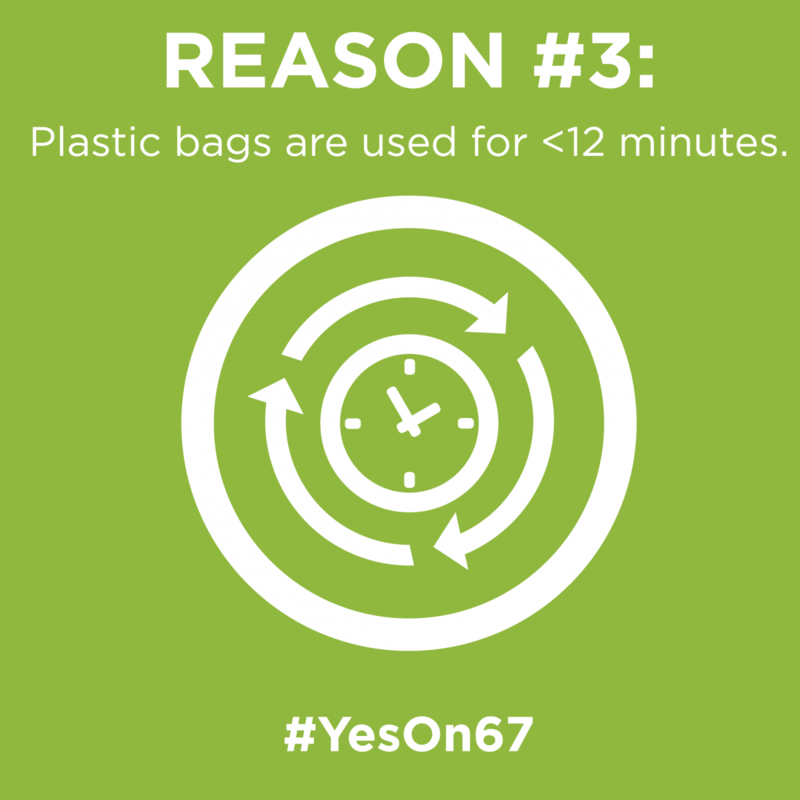 And by the looks of it, that number is set to grow; City Councils in Sacramento, Culver City and Huntington Beach, among others, are currently engaged in discussions about whether to enact their own single-use bag ordinances. The idea of reducing the economic waste and environmental impacts associated with single-use bag litter has even spread to the California statehouse where State Senator Alex Padilla (D-Pacoima) and State Assembly Member Marc Levine (D-San Rafael) have introduced bag bills. But first we have to reach the tipping point by passing the Los Angeles bag ordinance. Stay tuned for more information about the City Council’s final vote later this spring and how you can get involved! Follow us on Twitter to stay-up-to-date. Want to help reduce marine debris? Join one of our cleanups! Stay engaged with Heal the Bay as we head toward the finish line in Los Angeles.